Sometimes you don't realize how many pairs of pants and jeans you have until you actually try hanging all of them up. And once you realize how many pairs of pants you have, it's usually too late. You're already in your college dorm room trying to hang three pairs of jeans on one poor hanger. Don't let this happen to you! It's perfectly okay that you have 10 pairs of jeans, or way too many skirts, as long as you have our 4 Tier dorm Closet Hanger. It just doesn't make sense to hang all of your skirts or pants on individual hangers. Because if there's one thing dorm rooms don't have, its extra closet space. Our 4 Tier Pants/Skirt hanger lets you bring all of your clothes to your college dorm room without any clutter, mess, or cramming. The gel gripped design of our hangers guarantees that your pants and skirts will stay safely off the floor. That is what hangers are for, right? Great college supplies should be worth double the value that you have to pay for them. And considering that our dorm hanger gives you not 2, but 4 tiers, it's obviously worth 4 times what you're paying for it! With essential college supplies like our 4 tier hanger, living in a small dorm room will be a breeze. 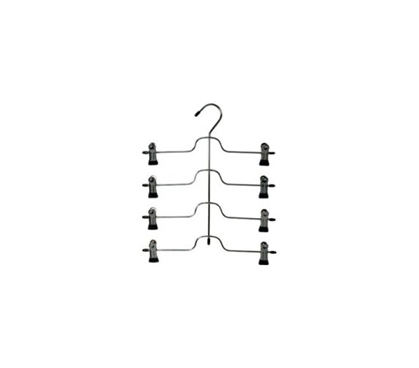 Solve the inevitable dorm room small-closet-problem with our affordable, useful, and functional 4 tier hanger.